“Marked with the cross of Christ forever, we are claimed, gathered, and sent for the sake of the world.” (Sent! by God's grace for the sake of the world, July 2006, "Global Missions Event." 5). This is the sermon I preached last Sunday, 9/16/18, at St. Timothy Lutheran Church. The text was Mark 8:27-38. Be patient toward all that is unsolved in your heart. Try to love the questions themselves, like locked rooms and like books that are written in a very foreign tongue. Do not now seek the answers, which cannot be given you because you would not be able to live them. And the point is, to live everything. Live the questions now. Perhaps you will then gradually, without noticing it, live along some distant day into the answer. This passage of Mark brings with it lots of questions besides those Jesus asked his disciples. For those of you who read the e-ministry, you saw some of mine. And don’t we find ourselves longing for certainty? As we look at this passage, entertain your own questions as well, for you will find that it’s good to have questions. We may not get the answer right away or ever in this life. That’s part of the journey. The questions of this gospel reading are set in Caesarea Philippi, originally a place of Baal worship. It was later called Paneas since it was the site of a pagan shrine to the god Pan. Later the Romans took over and it was renamed after Caesar Augustus. Herod’s son, Philip, enlarged it and renamed it after himself and Tiberius Caesar. In the time of Mark’s writing of his gospel, the war between Rome and the Jewish revolutionaries was raging or had just ended. It was a staging area for Roman troops, while some Jewish prisoners had been tortured and killed there. The Romans honored Caesar as lord, savior and son of god. Mark and his readers likely lived in this area. It is in this context that Jesus asks two questions. 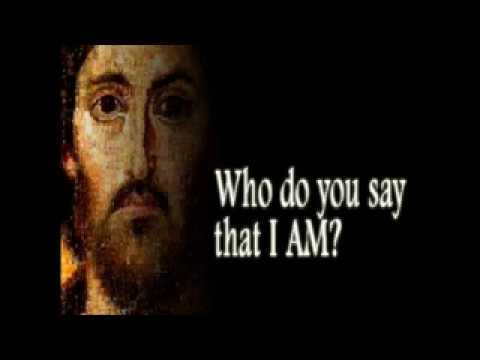 The first is, “Who do people say I am?” Why is he asking since he is God and knows the thoughts and minds of people? Is it for his own information? No. It’s to get the disciples thinking! I saw this exemplified on internship in WV. While at a clergy group discussing one issue or another, my internship supervisor would ask a simple question as if he didn’t know the answer. At first, I thought how could he not know the answer to this? It’s simple. But he was using the question as a device to make people think so that they could come to a conclusion not based pat answers. I am frequently reminded of Pastor Larry’s methodology. People on the street were responding to this question in various ways—John the Baptist, Elijah or one of the prophets. The thing is, they were all dead. Elijah was dead but believed to be coming back. John the Baptist is the one who heralds the beginning of the Kingdom of God here on earth. Elijah is the one who comes before the end. Jesus was popularly known as a prophet, whether one of the dead ones now restored to life or as THE end time prophet who stands in the prophetic line. The disciples report the facts, feeling pretty certain they’re on solid ground. Jesus neither affirms nor denies their answers, but all these responses fall short of confessing Jesus to be the definitive revelation of God, the one in whom God acts decisively for human salvation. Now Jesus poses a second question, “Who do you say that I am?” This is about discipleship. In fact, this may be the KEY question of discipleship. Jesus wants his disciples to consider who he is to them. He’s saying, forget about other people’s theologies and understandings. Put aside tradition. Think about the life we have lived together: the bread we’ve broken, the miles we’ve walked, the burdens we’ve shared, the tears we’ve shed and the laughter we’ve shared. Who am I to you? The disciples do not respond as quickly and surely as they did to Jesus’ first question. Can’t you imagine them a bit like schoolboys? Maybe they were avoiding eye contact with Jesus, shuffling their feet, casting anxious glances at each other. I imagine they all desperately hoped someone else would answer. CuePeter who responds, “You are the Messiah.” The Messiah is the anointed of God sent to save people from their sinful ways. This is the first time in Mark’s gospel that Jesus accepts the title of Messiah, the Anointed One awaited by the Jews. Messiah in Hebrew, Christ in Greek and anointed in English all mean the same thing: the One chosen by God and inaugurated into the office of prophet, priest or king. Didn’t Peter deserve a pat on the back? After all, he gave the answer that was the gospel in a nutshell, the truth with a capital T, right? Well, things get weird here now because Jesus basically tells him, “Shut up! It’s a secret.” A common charge of Jesus in Mark’s gospel is to be quiet and not tell anyone what has happened. Why would that be? No one in the stories can really understand what the life of God’s kingdom is about until after Jesus’ death and resurrection. Prior to that, even the disciples, who are in on the secret don’t get it. Jesus is inviting his disciples to live a question. “Who do you say that I am?” He asks this as they make their way through the villages of Caesarea Philippi. Who am I? Where do I stand in this life we’re making together? What do I mean to you? Peter got the right answer and can’t tell anyone about it. If that isn’t bad enough, Jesus spells out what being the Messiah means. Here Jesus gives the first of three passion predictions—that he would be crucified and would rise from the dead. Jesus begins to teach and fills the traditional words with new content. The Son of Man must suffer. For the first time, Jesus explains that being the Messiah means suffering, death and resurrection. This is scandalous! The fact that the Son of Man must die reverses religious expectations. It was expected in Jesus’ day that the Messiah would deliver the Jewish people from the Roman occupation. How could he do that if he was dead? Those for whom Mark was writing in around 70 AD, saw Jesus as the Son of Man whose appearance marked the beginning of the end of time. Jesus doesn’t keep any Messianic Secret but states openly what it means that he is the long-awaited Messiah. Jesus paints a picture so bleak, so upsetting and so counter-intuitive that Peter pulls him aside and we see a scene of mutual rebuking. Peter is not responding out of affection for Jesus. This is a theological response to Jesus’ outrageous declaration that shatters all previous ideas of what the Messiah would do and be. When Peter pulls Jesus aside, he keeps rebuking Jesus. Peter’s response to Jesus’ teaching is scandalous. Imagine the idea that Peter now rebukes Jesus contrary to God’s purposes, the scriptures and Jesus’ bold revelation; heightening the conflict in this scene. Peter has overturned the usual relationship between teacher and student with his action. Now the action reverses, with Jesus taking the lead. Jesus looks at the disciples, rebukes Peter and tells him, “Get behind me, Satan!” Now that sounds pretty harsh. Jesus is calling Peter Satan? Jesus is not telling him to get out of his face. He is trying to restore Peter to his proper place behind Jesus—as a follower and disciple, not as someone who is trying to teach Jesus! In further teaching, Jesus clarifies and broadens the call. This is for everyone, not just the first followers of Jesus. The crowd was also included in this extended call. The call to take up the cross indicates that the Christians of Mark’s time anticipated persecution. Mark was writing for us as well. The call goes out to all. This is not to say that we are to seek martyrdom or that we are to acquiesce to conditions of misery. And we are certainly not to be doormats if we are in an abusive relationship. The call is for denying oneself, taking up the cross and following Jesus. There is also the upside-down seeming teaching of saving and losing your life, for Jesus’ sake and the gospel’s, as well as not being ashamed of Jesus. And God really wants us to believe that this is good news? To follow Jesus requires sacrifice. When we are willing to sacrifice our comfort, our certainty, our judgments, our old vendettas—only then will the kingdom of God be realized—that is the good news. I have been doing physical therapy again. Some of you have done so from time to time. It is sometimes loving called “physical torture.” Is physical therapy good news? I don’t think so, but only through the hard work of faithfully doing the exercises can healing happen. We desperately need spiritual therapy and it will be painful, but so rewarding. The call to us today, in answer to who Jesus is, is to live countercultural lives with countercultural values. We are set in the end time, the beginning of the conclusion of human suffering and injustice; first seen in Jesus’ resurrection. We like sure and definite answers to our questions. We like the black and white, yes or no answers. The gray is hard to embrace. And yet, that’s part of living the question. We are now beyond the time of the Messianic secret since we live on the other side of the cross and resurrection. After that event, Jesus no longer told his disciples to keep silent, but rather, told them to go and make disciples of all. How do we shy Lutherans do that? As we do works of love—feeding the hungry, aiding those who have suffered from storms like Florence, working to fight drug addiction in our city…we do it all in Jesus’ name. That means it’s not only the doing but our motivation for doing such things. Is it to make ourselves feel good? Is it because we think we should and do so out of guilt? Is it because the love of God compels us? We bemoan low church attendance, but are we telling others about what God has done in our lives and inviting them to join us on this journey of faith? As I’ve been getting to know you better through my listening tour, hearing your stories of how and why you became part of St. Timothy and why you’re still here, nearly every one of you has said it is because someone invited you. You’re still here because of the relationships you have formed with others. It is hard to share our faith, but it is what we must to do grow. The same thing that brought you here will bring others. The gospel is not a popular lifestyle, to take up the cross and follow Jesus, but it is a deeply enriching, change your life and change the world kind of lifestyle. How can we change the world? Think about all those people who were and are in the path of Florence. What can we do? We can pray for them and for all those working to help them. Maybe there are some of us who are physically able to go and help. We can give to the Lutheran Disaster Response. We can remember this disaster and its people long after it’s no longer in the news. When all is said and done and the immediate rescuing is over, who will these people say Jesus is? If we were to ask, would we hear that Jesus is: the One who brought someone to help me, the One who saved my life, the One who keeps me going on or maybe the One I can count on? You’ll notice a whiteboard with pens in the narthex, with the question, “Who is Jesus to you?” I would like you to put down your answers before you leave the sanctuary. This is not a theological test, but I want to know how God is speaking to you. Let us together in this journey of faith be unafraid of “living the questions.” Let us allow mystery and possibility close to our hearts so they can work on us, shape us and transform us. Live into Jesus’ question of “Who am I?” On our journey, let’s invite others to join us. Jesus reveals himself to us so that we may reveal him to the world in word and deed. change the world cost of following Jesus Mark 8:27-38 who am I? who is Jesus to you? Labels: change the world cost of following Jesus Mark 8:27-38 who am I? who is Jesus to you? This is the sermon I preached on Sunday, Jan. 6, Epiphany at St. Timothy Lutheran Church. The gospel text is Matthew 2:1-12. Now, this is a story we know. We’ve seen the scene of the wise men bringing gifts to Jesus so many times in so many pageants. Epiphany is a time when we celebrate the in-breaking of God’s light in God’s way. The Magi are drawn from the east to come and pay homage to the Christ child. There are many theories as to who the magi were: from Zoroastrian priests to astrologers to magicians to kings, while some believe that the Magi were simply a literary device utilized by Matthew. They may have been any or all of the above, but the point is that they were foreigners and gentile outsiders and yet, God spoke to them through a star, through the light and they followed that light. This is the sermon I preached last Sunday, 12/27/19 at St. Timothy Lutheran Church. The gospel was Luke 4:14-21. In the time after Epiphany, we see more revelations of Jesus in the gospel. Today’s is Jesus’ controversial proclamations in his home town. We see the centrality of the life of the Spirit in Jesus’ life of ministry. The Holy Spirit descends on Jesus after his baptism (3:22), then fills Jesus before he was sent out into the wilderness to be tempted by the devil and in this passage of Luke the Spirit fills Jesus with power. The role of the Holy Spirit is central in Luke’s Gospel. Jesus’ first public words were “The Spirit of the Lord.” The first three phrases in Jesus’ reading tie his ministry to the work of the Spirit: “The Spirit…is upon me…because [the Spirit] has anointed me…[The Spirit] has sent me.” In Jesus’ repetition of “me,” we hear his claiming of Isaiah’s words for himself. This is the homily I shared with the people of St. Timothy Lutheran Church for Ash Wednesday. The gospel text was Matthew 6:1-6, 16-21. The first time I heard the expression, “Go big or go home,” was my senior year of seminary. A dear friend mentioned how during a children’s sermon at her internship site, when she was talking with the kids about how God wants all of us, this young man explained it as “Go big or go home!” It really struck all of us who heard my classmate relate this story. Today’s gospel lesson is like two bookends with a bunch of information between them. The first verse is the first bookend. Then Jesus talks specifically about different faith practices and how they should and should not be practiced. Finally, the second bookend surround the words in between with the final verse regarding the treasure of our hearts. Jesus calls us to follow. Jesus longs to gather us. Lord to whom shall we go? Luke 13: What goes around comes around?